This was the first feature story I wrote, after a couple of concert reviews. I was 18 years old. It was published in the St. Petersburg Times Sunday, Feb. 20, 1977. It’s reproduced here exactly as it was written. 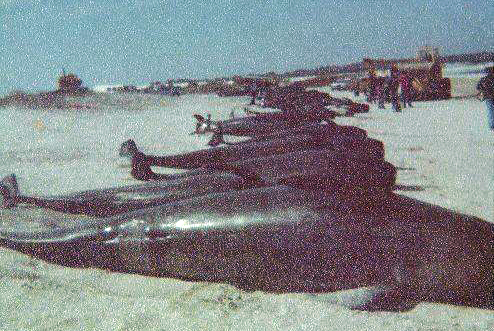 MAYPORT – A large school of pilot whales (globicephala melaena) committed suicide in a mass beaching at Fort George Inlet two weeks ago near Jacksonville. Less than 48 hours later, I was there dragging dead whales out of the surf and observing post-mortem scientific activities. The pilot is a toothed whale. It does not exceed 20 feet, but is very muscular and bulky. It is completely jet-black, prompting the common name Blackfish. Fort George’s Inlet is a deep, choppy channel barely 65 feet wide, running off the Atlantic in a mushroom-shaped bay. At one side of the bay is a bridge, behind which lie salt creeks and marshes. All around the rest of the bay is broad, white beach, running back to high dunes and seaoats. ON THE DAY of the beachings, commercial fishermen spotted a herd of upwards of 200 pilot whales headed, rather deliberately, for the mouth of the inlet. Because the pilot whale is a deep-sea mammal, the fishermen knew something was wrong. “As the fishermen saw the whales going past and towards land at high speed, it was all they could do to get their nets up in time,” said Quentin White, a member of the scientific crew from Jacksonville University. Mass suicides, while not common, have appeared with some degree of regularity on Florida coastline. Last summer, a small group of spinner dolphin beached and died at Casey Key near Sarasota. 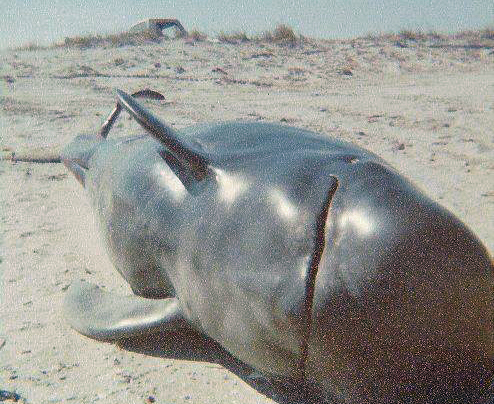 Within the following month, larger groups of False Killer whale beached at Fort Myers and Loggerhead Key. Whether these suicides are deliberate or accidental is a point of speculation. In autopsies taken on self-stranding whales and dolphins, the common factor seems to be two kinds of parasites found living in the animals’ inner ear. THE PARASITES, the theory goes, throw off the animals’ delicate sonar, a hearing mechanism that allows them to navigate and locate food sources. Thus impaired, the whales swim frantically, and when the pod leader, or “pilot,” swims too close to shallow water, the entire group follows him straight into the shallows and right into the beach. In such shallow water they cannot maneuver, and having neither the strength nor the will to return to deeper water, they eventually roll on their sides and drown. The animals’ blowhole, or nostril, is located at the very top of its head. When they roll over, water gets in the blowhole, and they lay helplessly, waiting to die. The ones that make it onto the beach die of exposure. As soon as word got around, volunteers of all ages came to the stricken whales’ rescue. Frogmen came from nearby Mayport Naval base, skin-diving clubs turned out in wetsuits and rough weather gear, and scientific researchers from several Florida colleges arrived in vans full of equipment. More than 150 whales, ranging from monstrous bulls 20 feet long and weighing close to a ton, to calves five feet in length and barely a year old, were lined up at various points on the beach or in shallow water. SOME WERE floundering off the bay’s entrance, still others were stranded on a sandbar several hundred feet into the chilly water. The volunteers’ objective was to right the whales and drag them into deeper water. The volunteers worked long into the night, and all the next day, trying to keep beached whales alive and grouping up to drag larger animals into deep water. But beaching whales seem to have a death wish, and, to the workers’ horror and dismay, the unencumbered whales turned right back around and beached again. During the first day, the situation became so frantic that the Marine Patrol had to block off entrances to the beach, to keep the ever-expanding mob of residents, curiosity-seekers and by now unneeded extra volunteers from getting in the way. Someone came up with the idea of herding the whales back out of the channel with boats. Several dozen whales were tagged on the dorsal fin with red plastic tags. These were mostly in the deeper parts of the bay, where a little maneuvering was still possible. At the first high tide the boats were brought around, and the roundup began. Apparently, the attempt was partially successful. “They were playing it right, getting the whales into the channel. Some of them went out into the Atlantic. But then” – and then the Mayport resident speaks quietly – “one of the big whales made a shrill noise and they all turned and dived under the boats.” Moments later they went back in the shallows, dying with the remainder of the school. Dr. James Mead, curator of mammals from the Smithsonian Institution, was expected to arrive the next day to begin autopsies. Slowly the volunteers dispersed, leaving an aura of hopelessness and sadness to the scientists and onlookers. The last glimmer of hope for the living died away and finally no one made any attempt to save the last few suffering individuals. The beach at Fort George Inlet is long and wide, and the sand, continuously shifted by the cold Atlantic wind, made travel by car extremely difficult. As I walked from the last road to the first group of scientists, I could see the Marine Patrol digging a Humane Society van out of the sand. The tide was high and I spotted a black fin protruding from the breakers. There were several whales there; all dead, all on their sides. Up the beach researchers from the University of Florida were standing around a group of whales. These were cows and calves, the smaller whales pulled far up on the sand for autopsy. The creatures were beautiful, so streamlined, so perfect. Their dorsal and pectoral fins, stiff and cold, jutted up into the air. Their expression was that of a creature from a different planet: very distant, very foreign. They all had the same trace of a smile; and I had trouble visualizing them as carefree, free-swimming creatures. One calf, I noticed, was completely decapitated. “They arrested some guy here yesterday,” volunteered one of the scientists. “He came down here in the middle of all the activity, and cut off its head with a chain saw.” He had wanted to take home some whale teeth. A DISTANT FIGURE on the far point of the bay, near the mouth of the inlet, was Dr. Mead, who had arrived a few hours earlier and was investigating the situation. As I hiked the good mile of beach to the point where I would find Dr. Mead amid a large concentration of dead whales, I heard a blast of air and looked out into the water. There, about 60 feet out, lay the last live whale, floundering in two feet of water. She twisted and turned, and every 10 seconds or so she would raise her tail and blow out her blowhole. I stared hopelessly from my isolation on the beach, wondering if I should try and help her, as she blasted out her pain in gradually weakening spurts. Then I realized her destination was already planned, and, remembering the admirable but vain efforts of the volunteer corps, I moved on, as the tide slowly carried her shallower. “THIS IS AN extremely large beaching,” Mead said, gazing at the scores of fins sticking up from the now receding tide. “Pilot whales are very sociable animals, but usually the big school will split up out at sea and beach at different locations.” Mead said he expected the group of whales driven out of the inlet the previous day would merely beach themselves somewhere else. 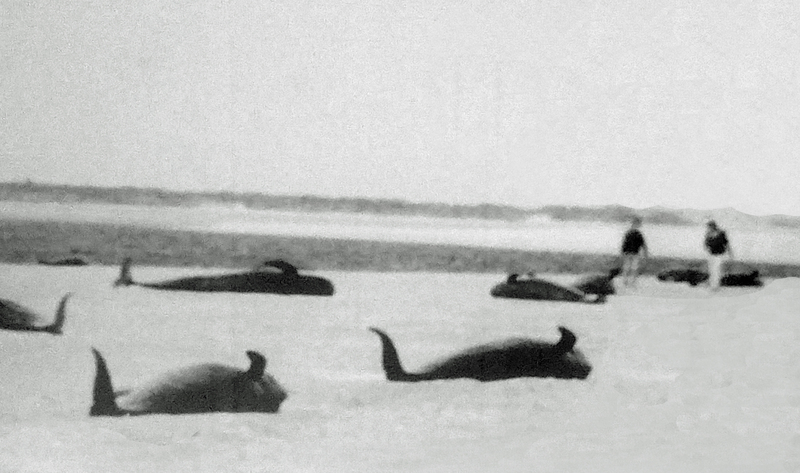 Several different accounts of the number of dead whales were circulating, but most believed the figure was about 100. He said the problem with the parasite theory is that scientists don’t have the opportunity to examine normal, wild pilot whales to check for the parasite. “The narwhales and belugas, both northern dwellers, also have parasites in their inner ears.” To further complicate the situation, the beached spinner dolphins, when examined, were found to have parasites in what would well have been normal amounts. “The pilot whale’s way of life is quite different. While the narwhales, belugas, and bottlenose dolphin are close relatives, there is one important difference: they all live in coastal water, that is, close to land mass and shallows. The pilot whale, as well as the spinner dolphin and false killers are deep-sea dwellers and as such, they don’t realize the ocean has sides and a bottom,” Meade said. “THEN, WHEN their sonar or hearing, is impaired, they swim right into the shallows, get confused, and try to keep swimming. They don’t understand confinement. They’re virtually helpless in shallow water. ”We don’t fully understand the hearing mechanism, so we can only assume that these parasites, in abnormal numbers, are driving the animals into these frenzies.” The beachings then may be more a case of running into a land mass than looking for a beach to kill themselves on. Whales have beached en masse for thousands of years and it is easy to remain detached when you hear about it on the news, but being there, seeing so many, beautiful, intelligent creatures lying still on the edge of their world, I felt a kinship with them. THE DOLPHIN is the most intelligent animal next to man, and I wished I could see these whales slide back into the water, out of this foreign tomb. I wanted to shout to them, “Prove it!” But everywhere along the coast of the small bay, still flukes and stiff fins revealed that the story had run its course. The waves would roll them back and forth, revealing the glassy eyes and rows of short, white teeth. The scientists and workers hauled all of the carcasses onto the sand in a long line. All of them were towed there by the tail, and every one of them faced the ocean. Walking back down the beach, now at low tide, I again passed the last whale. She was completely stranded now, on the edge of the receding tide. Painfully she breathed, loud, gasping sounds emerging from her blowhole as she exhaled. I WET MY HANDS and stroked her head. Her sides heaved and she made several feeble efforts to raise her tail. I was alone. The scientists, reporters and officers were all busy with the autopsies. I wet her dry skin and talked quietly to her. I looked down at her eyes to see if she was watching me; they were closed tightly, the skin around them contorted as if she was straining to keep them closed. And coming from both her eyes in a slow, steady stream were thick tears. I knew that whales, as well as other marine animals, did this as a way to dispel excess salt from their system. Still, if she had ever had reason to cry, this was it.